Just a quick reminder...help me help cancer survivors and have some fun in Leadville at the same time! Click here to donate and send a cancer survivor to what might be the most important week of their lives. Altitude. It is the natural enemy of endurance sports. The reason is simple...oxygen. The body needs oxygen and needs it in great quantities just to function normally, let alone to participate in an endurance activity. Our bodies can do some pretty great things without food and even without water, but try to go more than a minute or two at rest or even just a few seconds while working hard without oxygen and things go south in a hurry. What's that got to do with altitude? Simple, there's less oxygen available due to the air pressure reduction that happens the higher we go. For every 18,000 feet above sea level that we go, there's half the oxygen available as the previous level. Most humans will start to feel the effects of altitude at around 5,000 feet...simple things like a little shortness of breath just going up a single flight of steps! If you've been following this blog, you already know that I'm training for the Leadville Trail 100 MTB Race. In case you've forgotten, it's 103 miles of distance to pedal, but the real issue is that the entire race happens between 10,000 and about 13,000 feet. On top of that, there is 14,000 total feet of climbing. So as you can imagine, that means there are some very serious hills in terms of both grade and distance, and with them being above 10,000 feet, the altitude will definitely be a huge factor. So what can someone who lives basically at sea level do? You can either move to altitude and train and live there, or do what some consider to be a better alternative, and that is "live high, train low." What that means is you find some way to spend at least a third of every day at altitude, and do all your training at sea level (or near it). The theory there is that you only need about a third of each day at altitude for your body to acclimate to it. So it boosts the EPO in the blood (yes, the same stuff that performance enhancing drugs help with, except in this case it's completely legal since there are no actual drugs involved) and you get the benefit of that higher level of EPO while training with plenty of oxygen. That keeps your body from breaking down as easily from the lack of oxygen while working hard. So how do you achieve that? The most common way is an altitude tent that you sleep in. There are a variety of tent styles, but I chose the one pictured, which is a full enclosure. The air supply for the tent is an air unit that's in another room to suppress the noise from its compressor. What it does is scrub a set percentage of the oxygen out of the air that it feeds to the tent. So it's not exactly the same as going to altitude, but it's the same effect. So I'll start sleeping in the tent at a simulated altitude of about 3,500 feet, and move from there every week or so on up to 10,000 feet (the limit of my air unit). Now, my wife refused to sleep in such a contraption, but fortunately there was enough room in our bedroom to setup an additional double bed and put the tent on that. So we'll be sleeping apart for a while. Obviously not ideal, but sometimes you have to do some extreme things. In my case, this is probably a little more important than for most people who do a race like this, because I seem to be more prone to altitude problems. I've had altitude sickness just from two days of snow skiing in Tahoe (which is 10,000-13,000 feet as well), and can feel the effects pretty significantly at anything above 3,500 feet. In an attempt to monitor what's going on, I have an oxygen sensor, to make sure my air unit isn't scrubbing too much oxygen. After some testing, it seems to be working fine and I'll start to use it for the first time tonight. 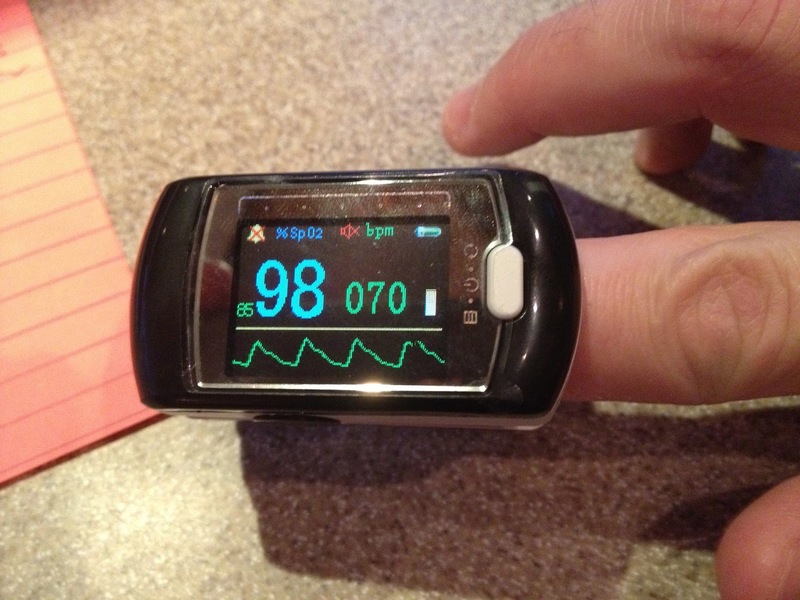 I also have my own pulse oximeter so I can monitor the oxygen content of my blood. So between the two, I should be fairly well covered medically. A plus of the pulse oximeter is that it gives you your pulse easily and quickly, and my resting heart rate is down to 42! That's pretty good. Want to run more this year?